Concerning Fashionart(FAI) income projections. McCormack comments on the disappointing income projections once Laraine Ashton and Vidal Sassoon are subtracted and emphasizes the importance of reaching a stated designer and import/export goal. 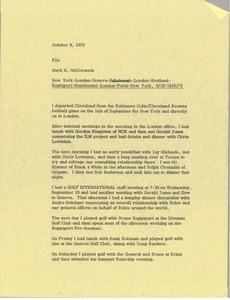 McCormack summarizes his recent trip to New York, London, Geneva, back to London, Scotland, Southport, Manchester, back to London, Paris, and then back to New York. He notes business meetings and their outcomes, and lists expenses incurred during his travels. 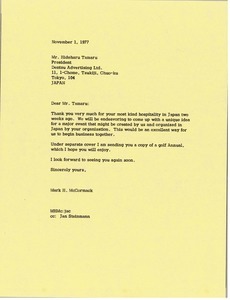 McCormack will be in touch regarding ideas for a major event in Japan. 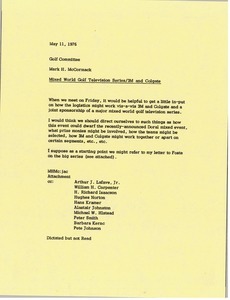 McCormack notes that Arnold Palmer has an arrangement with NBC which precludes him from participating in a golf event to be aired on any other television network. With this in mind, McCormack would like Papiano to tell him more about what he has in mind in terms of sponsorship and television. 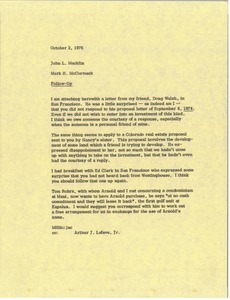 Forwarding a letter from Doug Walsh, who was surprised that Macklin did not respond to his proposal letter. 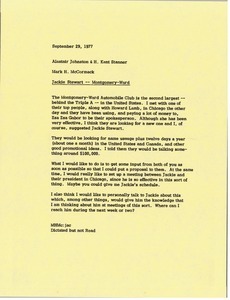 McCormack explains that in the future, even if they aren't interested in an investment, they should still give the courtesy of a response. McCormack would like input on how the logistics might work for a 3M and Colgate joint sponsorship of a major mixed golf television series. McCormack would like to discuss the situation with Spalding in terms of its marketing strategies. 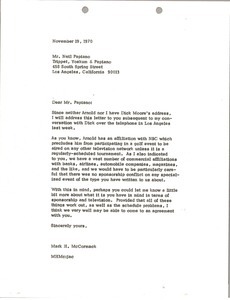 McCormack would like to take Arnold Palmer and his golf equipment arrangements throughout the world. 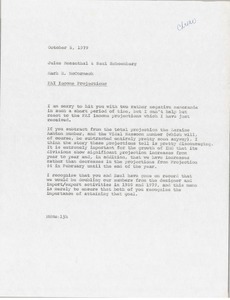 McCormack writes regarding a proposal for Jackie Stewart to be the spokesperson for Montgomery-Ward Automobile Club. 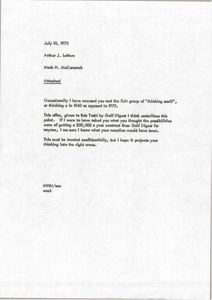 McCormack reiterates his feeling that Lafave and the ILM group sometimes think small, and gives the Bob Toski issue as an example. 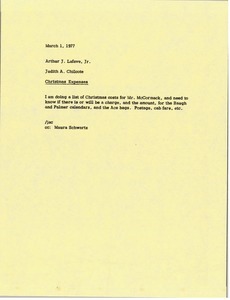 Chilcote requests information for a Christmas costs report to be given to McCormack. 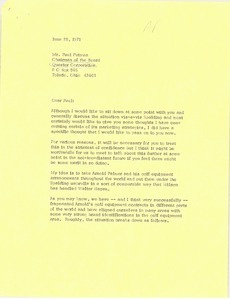 Information requested includes, Laura Baugh and Arnold Palmer calendars, Ace bags, postage, cab fare, and more.